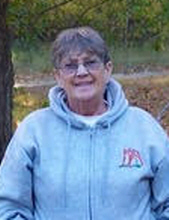 Hannah Irene (Wagar) Carpenter age 82 passed away at Genesys Regional Medical Center, on November 26, 2018, after a 4 ½ year battle with Pulmonary Arterial Hypertension. It required her to be on oxygen 24 hours - 7 days a week. She never complained about being on oxygen; and carried on with her life the best she could. She believed in the Lord, and loved to go to church with her kids when she could; we know and believe she is in a better place, free from all anxiety and sickness, and free from the oxygen machine and oxygen tanks! Hannah was born in Flint, Michigan on January 3, 1936, to Omer R. and Beatrice B. (DeMott) Wagar. Her Dad passed away when she was 2 years old. Beatrice raised Hannah and her sisters, Jane and Dolores, by herself. Hannah grew up in Flint and graduated from Flint Central High School in 1954. As fate would have it, a farmgirl from (Atlas Twp.) moved into Flint. Some “farm boys” came into Flint to visit her. One of the farm boys was James A. Carpenter, he saw Hannah and asked who she was. They were married on February 20, 1954, in Akron, Michigan, a marriage that lasted 64 years, 9 months and 6 days. She had a fulltime career, being a wife and a Mother to 4 kids; and she was good at it! Her house was always clean, and normally had the aroma of something delicious cooking on the stove or baking in the oven. When the kids were grown, and Jim retired, Hannah and Jim traveled, spending winters in Palm Harbor Florida and autumns at Canada Creek Ranch, Atlanta, Michigan, making many friends in both places. They loved to camp at Higgins Lake State Park, Canada Creek Ranch and Palm Harbor, Florida. Before being confined by the length of the oxygen tube, she enjoyed taking walks in the woods at the ranch; and walking on the beach in Florida, line dancing and music. Believe it or not she even took pleasure in hanging laundry outside on the clothesline! Hannah enjoyed watching Tiger baseball, crocheting afghans, doing embroidery, adult coloring and had a talent for coloring flowers, sudoku, scratch off bingo lottery tickets, going to the casino and her iPad! She watched her great grandchildren growing up, with the use of facetime and text message pictures, loving every minute of it! Even though her kids were in their 50’s and 60’s she was still concerned with their wellbeing. “Did you kids eat yet?” “Get your hat on!” “Where’s your coat?” “Listen here Buster!” She had a wonderful sense of humor, loved stuffed animals, and most of all she loved her family! Hannah was preceded in death by her parents, her sister Jane, niece Susie, two half- brothers and many other relatives. The Carpenter and Escobedo families would like to thank Dr. Joseph Shull M.D., Sherry and all the staff at Grand Blanc Family Medicine, for the excellent medical care and friendship, we love you guys! We also want to thank Dr. Aboudan M.D. and all the doctors and staff at Genesee Lung for taking excellent care of our Mom! We love you guys! A big thank you to the nurses at Genesys hospital, for taking wonderful care of our Mom! Thank you everyone for your thoughts and your prayers! May God Bless You Always. To send flowers or a remembrance gift to the family of Hannah Irene (Wagar) Carpenter, please visit our Tribute Store. "Email Address" would like to share the life celebration of Hannah Irene (Wagar) Carpenter. Click on the "link" to go to share a favorite memory or leave a condolence message for the family.